The hallmark of the immune response is its ability to react specifically to given antigen. The mechanism at the heart of this reaction is the way in which antigen is trapped, processed and recognized as foreign. 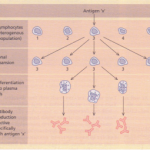 Several cell types, sometimes termed accessory cells, facilitate the antigen-presenting process. Macrophages and monocytes (mononuclear phagocytes) These cells are distributed throughout the body, in the tissues (as macrophages) and in the blood (as monocytes). Macrophages are equipped with various features that make them particularly effective at removing foreign antigens, ready for presentation. They are phagocytic and have, on their surface, receptors that recognize the Fc region of antibody molecules as well as biologically active fragments of complement (C3b). The presence of these structures on cells in the macrophage-monocyte family makes it easy for them to intercept and dispose of antigen-antibody complexes. Follicular dendritic cells are non-phagocytic and are located in the germinal centres oflymph nodes (follicles). They are surrounded by B lymphocytes to which they present antigen, usually complexed with antibody, on the surface of their dendrites. Their surfaces are rich in Fc and C3b receptors to facilitate antigen trapping. The Langerhans’ cell is found primarily in the skin. The dendritic (or veiled) cell is present in the blood (and is different to the follicular dendritic cell described above). They are of macrophage/monocyte lineage. 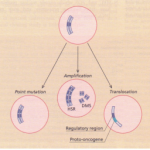 Antigen fragments are presented to T cells in association with either class I or class II major histocompatibility complex (MHC) molecules (see p. 128). Antigens that are presented with class II molecules are recognized by CD4+, T helper cells. Antigens that associate with class I molecules are presented to CD8+ T cells and a cytotoxic response results. The responding population of T cells thus recognize the combined shape of the antigen and the MHC molecule. The combination of T-cell receptor, MHC molecule and antigen fragment is known as the trimolecular complex. As there are differences in the three-dimensional shape of the MHC molecules due to genetic variation, some antigens may be more effective than others in inducing immune responses because they present an optimum shape or conformation to the T cells. Immune responses that only occur with certain antigen-MHC combinations are called MHC restricted. HLA (human leucocyte antigens) The HLA molecules are distributed throughout the body tissues and it is through differences in this system that cells are classified as self or non-self The possibility of two different individuals having the same combination of HLA molecules is very remote. It is this particular aspect of the immune system that presents problems for organ transplantation. Unless the HLA type of the donor and the recipient are virtually identical the organ graft will be recognized as non-self and rejected by the immune system of the host. The process of tissue typing involves the identification of the set of HLA antigens in the tissues of a given individual using specific antisera. Much of the immune system’s ability to communicate between its different compartments is achieved through the use of soluble messenger molecules called lymphokines (produced by lymphocytes) or cytokines (a generic term meaning made by any cell). Once the cytokine reaches its destination cell it then induces a biological effect, which will of course vary according to the cytokine and the cell involved, but typically these molecules will signal certain cell populations to activate, divide or home in on a particular site in the body. Many cytokines have been isolated, cloned and characterized by the use of recombinant DNA technology. Some are now being used in clinical practice. For example, IL-2 is used to combat kidney tumours and G-CSF (a substance that cause bone marrow cells to divide and mature) has found application in bone marrow transplantation and treatment of neutropenia.